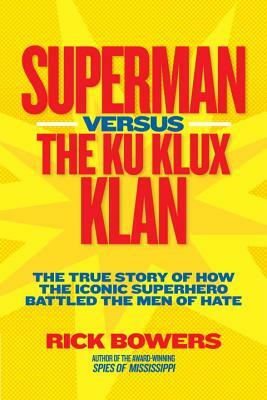 Superman Versus the Ku Klux Klan: The True Story of How the Iconic Superhero Battled the Men of Hate by Rick Bowers. Grades 8+ National Geographic Children's Books, January 2012. 160 pages. Review copy provided by my local library. He's faster than a speeding locomotive. He can leap tall buildings in a single bound. But could Superman defeat the divide between races in America? I found this book totally fascinating. I love history books that read like a story someone's telling me, but I am easily bored by a lot of history books (even when the concept sounds like something I'd be interested in). Superman Versus the Ku Klux Klan is a book that I didn't want to put down. It was so well told and so fascinating that it definitely kept my interest and I can see it having high teen appeal. In 1946, the Superman radio show broadcast a miniseries called The Clan of the Fiery Cross in which Superman takes on a white supremacist group modeled after the KKK. Rick Bowers weaves together two histories that would seem unrelated at first. He starts with the creators of Superman and explains how much the American people needed a superhero at the exact moment of Superman's creation. He goes into the rise of the comic book industry and Superman's phenomenal popularity. At the same time, Bowers details the rise of the Ku Klux Klan from its start as "a social club for a handful of men with time on their hands, a taste for the absurd, and a penchant for harmless mischief" (pg 57), through its rises and falls. Eventually the KKK would have thousands of members and carry out violent acts in the name of white supremacy. Bowers weaves these two narratives together in alternating parts. The fact of the matter is that the actual collision between Superman and the KKK was actually a rather brief event in the book, but the real meat is what leads to that point. Creators of popular media for CHILDREN were actually taking a social stand in the name of educating kids about racism. In 1946. It's kind of amazing. Back matter includes an index, a bibliography, and a list of sources. Rick Bowers ends the narrative with an afterword that explains what happened to the major players after the broadcast and public response. Bowers is the author of Spies of Mississippi: The True Story of the Spy Network That Tried to Destroy the Civil Rights Movement, a finalist for the 2011 Excellence in Nonfiction for Young Adults award. Superman Versus the Ku Klux Klan is on shelves now! And hey, it's Nonfiction Monday. Check out this week's roundup of nonfiction book reviews from around the Kidlitosphere at Books Together.